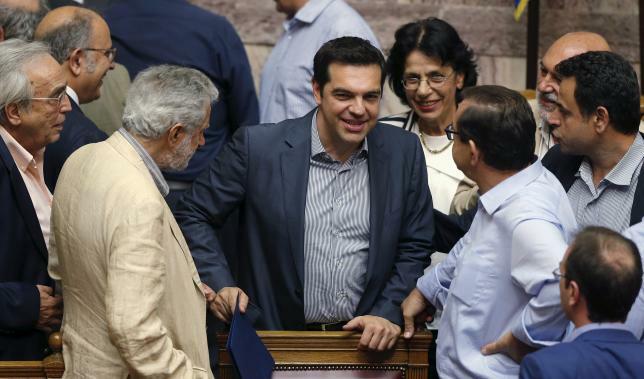 BRUSSELS/ATHENS – Greek Prime Minister Alexis Tsipras won backing from lawmakers on Saturday for painful reforms but it remained unclear it would be enough to secure a bailout from German and other euro zone ministers meeting in Brussels. In parliament overnight, Tsipras had to rely on opposition votes from the right after some of his leftist allies opposed spending cuts, tax rises and other measures he proposed in order to unlock 54 billion euros in three-year credit and save Greece from a bankruptcy that would force it out of the euro zone. But Germany, the biggest creditor in two previous bailouts totalling 240 billion euros ($265 billion), is deeply sceptical after five months of abortive negotiations. Euro zone sources said it was far from certain that the 19-strong Eurogroup of finance ministers would agree to open negotiations at a crisis meeting scheduled to start at 3 p.m. (1300 GMT). “The high figures for financing needs over the next three years may be too high and too sudden,” one said. He added that EU and IMF experts estimated Greece’s needs at 82 billion euros, factoring in cash to come from the IMF and other EU sources. A spokesman for German Finance Minister Wolfgang Schaeuble declined comment on a newspaper report that he found Tsipras’s proposals inadequate and would oppose further talks. He said the outcome of Saturday’s talks remained “completely open”. German Chancellor Angela Merkel has made clear she does not want to see a “Grexit” that could disrupt the ailing European economy and undermine a supposedly irreversible union. However, she faces stiff opposition among her own conservative allies. Euro zone leaders, including Merkel and French President Francois Hollande, are due to meet on Sunday, either to endorse the ministers’ decision or, along with other EU leaders, to take steps to contain the fallout from a looming Greek bankruptcy. Among the hawkish, small east European states whose voters are loath to pour more money into a country some believe the euro zone would be better off without, Lithuania’s finance minister said the Eurogroup would judge Tsipras’s credibility. “We have to take the best decision for the euro zone,” said Rimantas Sadzius. “We have to evaluate, how constructive and realistic it is … We have no right to blindly borrow taxpayers’ money – we have to be sure they will be paid back”. With Greece’s banks shut and completely dependent on a credit lifeline from the European Central Bank, the measures were seen as a last chance to avert financial collapse. The European Commission, ECB and IMF told euro zone governments after a review of Tsipras’s proposals that they was sufficient basis to start negotiating conditional loans from the currency bloc’s ESM bailout fund. Prominent leftwingers in his Syriza party signalled before the vote that they could not support the mix of tax hikes and spending cuts proposed by Tsipras, following the rejection of similar austerity measures by voters in Sunday’s referendum. Energy Minister Panagiotis Lafazanis, Deputy Labour Minister Dimitris Stratoulis as well as the speaker of parliament, Zoe Constantopoulou, all called “Present”, in effect abstaining from the vote and withholding their support from the government. “The government is being totally blackmailed,” Constantopoulou said. “The parliament today gave the government a strong mandate to complete the negotiations and reach an economically viable and socially fair agreement with its partners,” he said. The leader of the right wing Independent Greeks party, the junior coalition party in Tsipras’ government, said his lawmakers would back the proposals “with a heavy heart”. U.S. Treasury Secretary Jack Lew said on Friday that Greece and its creditors appeared to be closer to a deal, calling for an adjustment to Athens’ debt burden to ease its cash flow. Greece asked for 53.5 billion euros (38 billion pounds) to help cover its debts until 2018, a review of primary budget surplus targets in the light of the sharp deterioration of its economy, and a “reprofiling” of the country’s long-term debt. The latest offer includes defence spending cuts, a timetable for privatising state assets such as Piraeus port and regional airports, hikes in value added tax for hotels and restaurants and slashing a top-up payment for poorer pensioners.